تعزيز الردع على الجناح الشرقي لحلف شمال الأطلسي (الناتو). Across multiple games using a wide range of expert participants in and out of uniform playing both sides, the longest it has taken Russian forces to reach the outskirts of the Estonian and/or Latvian capitals of Tallinn and Riga, respectively, is 60 hours. 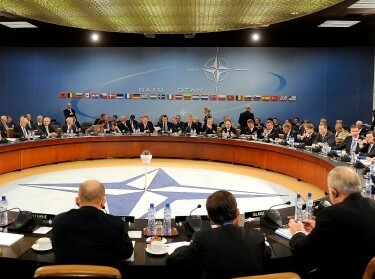 Such a rapid defeat would leave NATO with a limited number of options, all bad. A force of about seven brigades, including three heavy armored brigades — adequately supported by airpower, land-based fires, and other enablers on the ground and ready to fight at the onset of hostilities — could suffice to prevent the rapid overrun of the Baltic states. While not sufficient to mount a sustained defense of the region or to achieve NATO's ultimate end state of restoring its members' territorial integrity, such a posture would fundamentally change the strategic picture as seen from Moscow. While this deterrent posture would not be inexpensive in absolute terms, it is not unaffordable, especially in comparison with the potential costs of failing to defend NATO's most exposed and vulnerable allies. This research was sponsored by the Office of the Under Secretary of the Army and conducted the Strategy, Doctrine, and Resources Program within the RAND Arroyo Center. 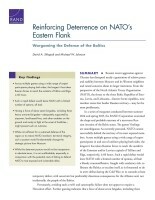 Shlapak, David A. and Michael Johnson, Reinforcing Deterrence on NATO's Eastern Flank: Wargaming the Defense of the Baltics. Santa Monica, CA: RAND Corporation, 2016. https://www.rand.org/pubs/research_reports/RR1253.html.